Holistic education cares for a child's physical, mental and emotional development. Your contribution provides meals, healthcare, uniforms, transport, school supplies, hygiene, buildings, and develops surrounding communities. We stretch your money to the MAX! More than 95% goes directly to the programs. When we educate our children, we empower our communities. Education is a universal right of a human being, and can help break the cycles of poverty, disease and social inequity. It equips children with the knowledge, skills and confidence they need to shape a better future for themselves, their communities and the world! Children in rural, tribal and slum areas are denied their basic needs, and are often forced into hard labor. They work in farms, or stay home to help with raising siblings. Let's educate them in our fee-free schools, and rescue the future generations! Can you spare just a dollar everyday to sponsor a child through an entire school year? Almost 95% of our children are first generation learners. Bring smiles to forgotten senior moms in hospices in the U.S, and to mothers of children in Jharkand, India! A single pledge will serve two causes! Our volunteers will make, and deliver beautiful flowers in vases for senior moms. A portion of the proceeds will also fund mid-day meals in our schools in Jharkand. What a wonderful way to honor and celebrate Mother’s Day! 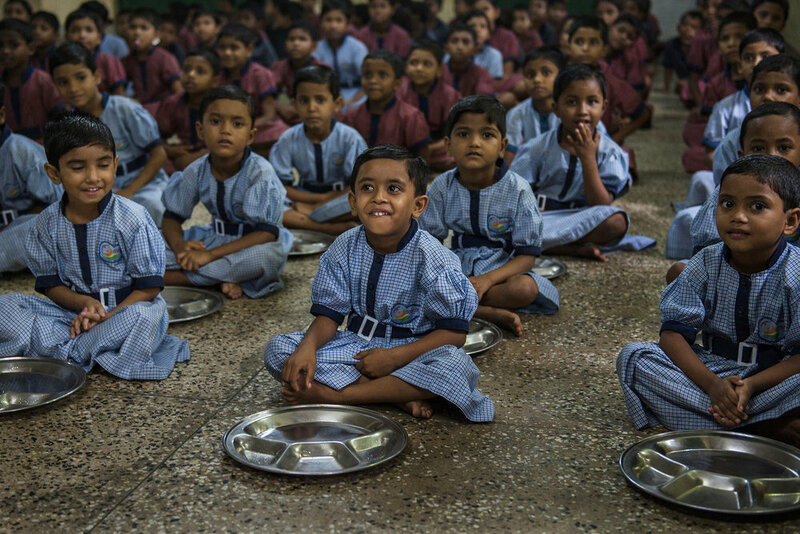 Parents send their children to school so they can have at least one proper meal. Our teachers ensure that their bellies full, they study and practice yoga, helping them blossom in life! One day, my husband came home and announced that he had given up drinking alcohol. Apparently, an Art of Living program was the reason for this change. He pushed me to do this program too. Barwatoli, Jharkhand is a tribal area where locals encourage their children to work for daily wages to shoulder their household expenses. Care for Children volunteers regularly visit around 17 villages (around 15 kms) to encourage and bring over 250 students to school and educate them. With the addition of two school buses, Care for Children will be able to cover 24 villages within a circumference of 25 kms. Our expectation is that school enrollment will quickly jump from 250 to over 500 students with the addition of transportation facilities. This fundraiser will cover the expenses for one school bus.